Day 82 of the Pink Collar Savvy & Chic on Purpose Project has me feeling like a shero – or my name for a female hero. The news that one of my male coaching clients has completed the second two phases of the three phase plan we partnered together to create was so rewarding. I supported him in setting goals that aligned with his purpose, helped him to establish action steps and encouraged him along the way. Then he took those steps and ran with them! The final phase was landing his dream job – check! I was so proud I jumped high enough to leap a tall building with a single bound! As wonderful as hearing his news was, having him express that I’ve helped him more than I know makes me feel like I can take on the coaching world. My purpose in life is to maximize my unique God-given strengths to coach, encourage, and inspire women to live live their best lives, all to the glory of God. The fact that this special man came to trust God and surrender control of his life to Him somewhere along his journey brings glory big time! And it reminds me that although my heart is to help women, serving as a powerful change agent in the life of a male is also a worthy endeavor. 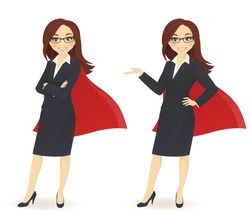 As a Pink Collar Savvy & Chic on Purpose Chick, I’m to use my coaching superpowers to be a shero for the good of all. What about you? What is your superpower? How are you using it to be a Pink Collar Savvy & Chic on Purpose Shero? At home? At work?